The theme for the final weekend (extending from Thursday April 6 to Sunday April 9) was "Politics and Religion." Nic Mathew, our faculty host/raconteur for the cycle, pointed out that Beethoven was a wartime composer. From the time Beethoven was a young man until he was in his mid-40s, Austria faced a succession of conflicts with revolutionary and imperial France. Vienna was twice occupied by Napoleon's army, in 1805 and 1809 (dates which correspond roughly to the times of composition of the middle quartets). 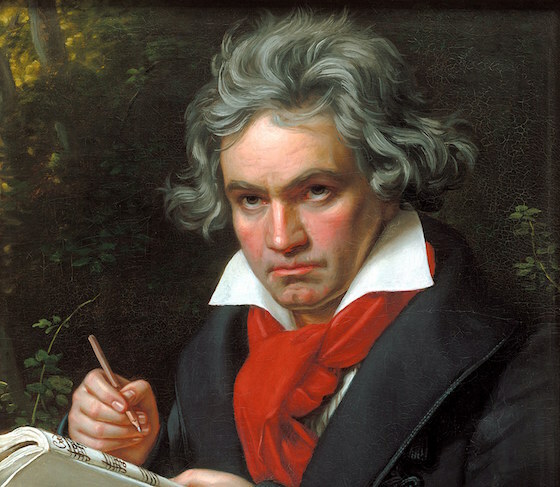 Perhaps a wartime sense of the upending of certainties informed Beethoven's restless style. That such restlessness can still be disorienting to listeners became apparent in the jam-packed back room at University Press Books during Thursday's Page & Stage Book Club discussion of first violinist Ed Dusinberre's Beethoven for a Later Age (University of Chicago Press, 2016). Someone in the audience brought up the jarring contrasts in Beethoven's music, how the mood or tempo or character of one musical idea is often instantly negated by the radically different mood or tempo or character of the next. As Mathew memorably said, in Beethoven's music sometimes "you don't know where to put your ears." After the Quartet finished the movement Dusinberre asked us for our responses. One woman in the audience mentioned that after the interjection of the bright fast music, she heard the slow music becoming less dark and more serene. What fascinated me was that I'd heard exactly the reverse: it sounded to me as though over the course of the movement the fast sections had taken on a more unsettled and searching quality. Listen, for example, to the way the reintroduction of the fast theme (around 6:32 in this recording) dies out after a bar or two before it is finally re-established (around 6:50), to my ears somewhat tentatively. In some ways, perhaps, the protean character of the music enables each of us to hear the Beethoven we want to hear. Which Beethoven do we want to hear? As Mathew pointed out in his pre-concert talk on Saturday, there are many Beethovens. The music we think of as "Beethovenian" is only one aspect of a musical style that within a single work or even a single movement, as in the example above, can be exceptionally varied. This is exactly the kind of music we usually expect to hear when we think of Beethoven. Only, the first excerpt is the opening of Joseph Haydn's Symphony No. 104 ("London," 1795, performed by the Philharmonia Baroque Orchestra conducted by Nicholas McGegan). And the second is the beginning of the overture to Luigi Cherubini's opera Anacréon (1803, performed by the Berlin Philharmonic conducted by Herbert von Karajan). So the musical rhetoric we think of as typical of Beethoven was actually already a part of the sound-world that shaped him as a composer: "Beethovenian" music existed independently of Beethoven. The other Beethoven is found primarily in the slow movements of the quartets: the second-movement Adagio from Op. 18 No. 1 (inspired by the tomb scene from Romeo and Juliet), the second movement from Op. 59 No. 2 (with the heartbeat motif), the third movement from Op. 132 (the "Hymn of Thanks" to be played "with inward feeling"), and the fifth-movement Cavatina from Op. 130 (to be played "slowly and very expressively"). And it is this Beethoven that I think I will return to again and again. During the open rehearsal Dusinberre mentioned in response to a question that knowing that this long, knotty movement was looming at the end of the Cavatina was likely to shade the Quartet's approach to the preceding music. And indeed when the Cavatina was performed on Sunday afternoon for the second time in the cycle, it seemed marginally less moving than it did in my memory of its first performance in the fall. Perhaps that was due to the power of Dusinberre's suggestion, to the enhancements and embellishments of memory, or to my greater familiarity with the music. But some of the other people with whom I've been attending the concerts mentioned a similar feeling, and it would be remarkable if even world-class musicians such as the Takács were utterly unaffected during the Cavatina by the prospect of Op. 133. If so, the only reason I could ever be grateful for the boisterous replacement ending that was played in the fall would be if it enabled a maximally profound Cavatina. In fact, I felt that both endings marred the Cavatina's hushed mood: I think Beethoven, a radical in so many things, should have taken the unprecedented step of ending Op. 130 with the slow movement. Summing up such a richly rewarding experience in a few words isn't really possible, for two reasons. The first is that every concert, as well as every pre-concert talk, open rehearsal, panel discussion, master class, symposium, and post-concert conversation presented multiple moments of intellectual and emotional engagement as well as points for reflection and reconsideration. The second is that this is music that resists any final conclusions, because it is so multifarious and encompasses such a broad range of feeling and expression. To seek some final coherence or unity is to look for a quality that Beethoven himself seems to have delighted in confounding. The quartets have to be accepted for their difficulties and incongruities as well as their profound beauties. And each new encounter with this music will be a different experience; as the the opening theme of the residency had it, performers and audiences together actively participate in its remaking each time. Very special thanks to Cal Performances' Director of Artistic Literacy Sabrina Klein and to Executive and Artistic Director Matias Tarnolpolsky for designing, organizing and implementing such a meaning-filled series of residency activities surrounding the concerts, and to Professor Nicholas Mathew of the UC Berkeley Department of Music for being such a brilliant and engaging host throughout. 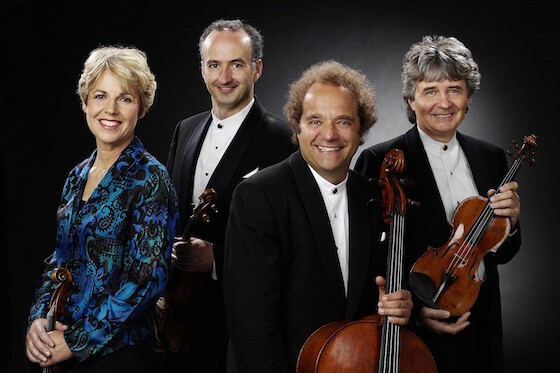 And my deep gratitude to the musicians of the Takács Quartet, who were unfailingly generous with their time and energy, and extraordinarily insightful on and off the stage.